The most ambitious form of treatment for AMN patients to date is the quantification of movement impairments. Scientists are still searching for comprehensive treatments for ALD. For the cerebral onset, an approach is needed that would overcome some of the limitations and risks of stem cell transplantation and offer a wider therapeutic window than current transplantation or Lorenzo's oil. For AMN, the adult version of ALD, options are needed to help with symptoms and prevent further deterioration. One of the most promising treatments on the horizon for ALD is gene therapy. This involves inserting the corrected genetic sequence with the appropriate -blueprints- into cells. The repaired cells will then produce the ALD protein that had been missing or defective prior to treatment, and the disease process will halt or moderately reverse. Since stem cell transplants (using donor bone marrow or umbilical cord blood) has been shown to halt the disease process, the idea behind gene therapy is to use a patient's own stem cells rather than those of a donor. This involves temporarily removing the stem cells from the person with ALD, inserting the corrected genetic sequence into these cells, and putting them back into the patient. 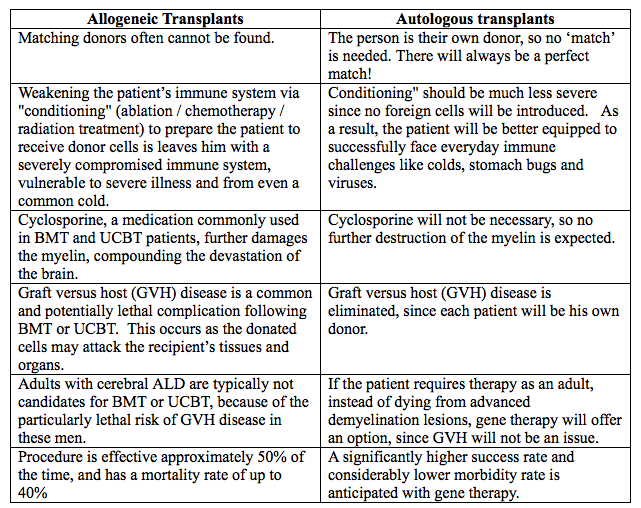 If a patient uses their own corrected stem cells, rather than a donor's stem cells, it is called an -autologous transplantation-. In an autologous transplantation cells are removed from an individual and reimplanted in that same individual. Because each person is their own donor, all of the problems and risks that arise from using an outside donor for stem cells can be obviated or significantly lessened. Successful gene therapy would yield the same positive results of stem cell transplantation, for many more patients, with far fewer risks. Early trials are very preliminary, but they appear very promising so far. Four boys with ALD have been treated with gene therapy in France; the first received his transplant in September 2006, and the second in early 2007. The results of the first two boys were published in Science November 2009. While gene therapy may be of great therapeutic value prior to the onset or at the early stages of ALD symptoms, it will not address the needs of boys who are only diagnosed after significant disease progression.